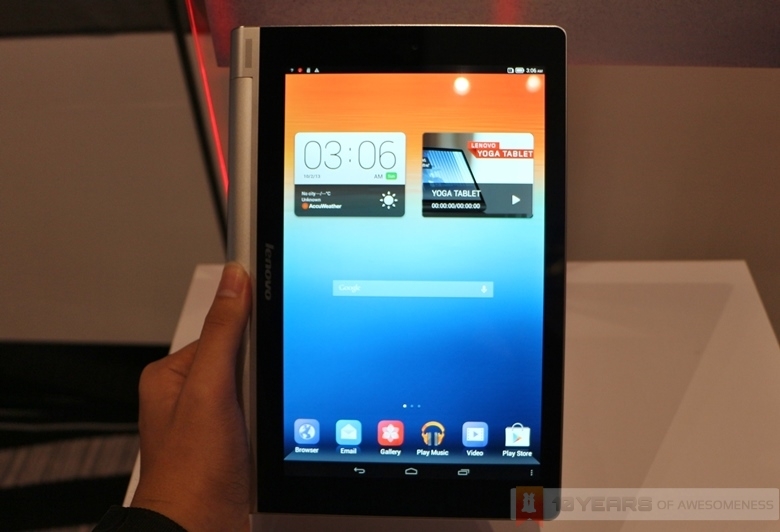 Lenovo’s bold new Yoga Tablet is finally available in Malaysia. While it was launched only yesterday, we were told that the new Android tablet has already been retailing for about a week or two now. The tablet, armed with an innovative integrated kickstand, is available in two screen sizes (8 and 10.1 inches) and is retailing from RM999. 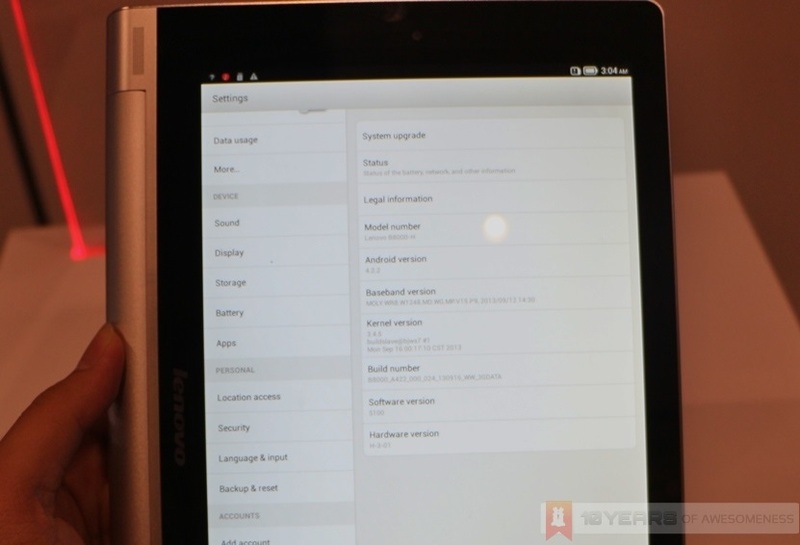 After its launch event, we had some time for a quick hands on with Lenovo’s latest tablet. Head on after the jump for some first impressions of the new device. 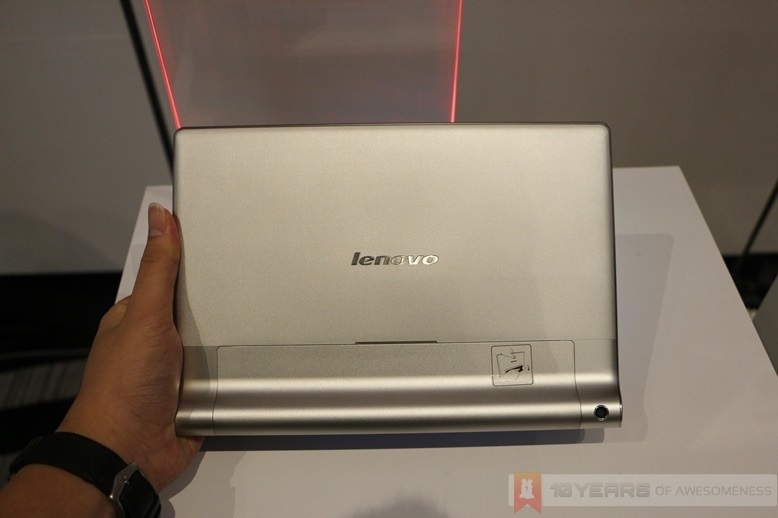 With the new Yoga Tablet, Lenovo’s gone for an approach that no other manufacturer has done before: integrating a kickstand into the chassis. The company’s rationale behind this is simple: most people who buy a tablet would be getting a case that includes some form of a kickstand, so why not build a tablet with a kickstand? 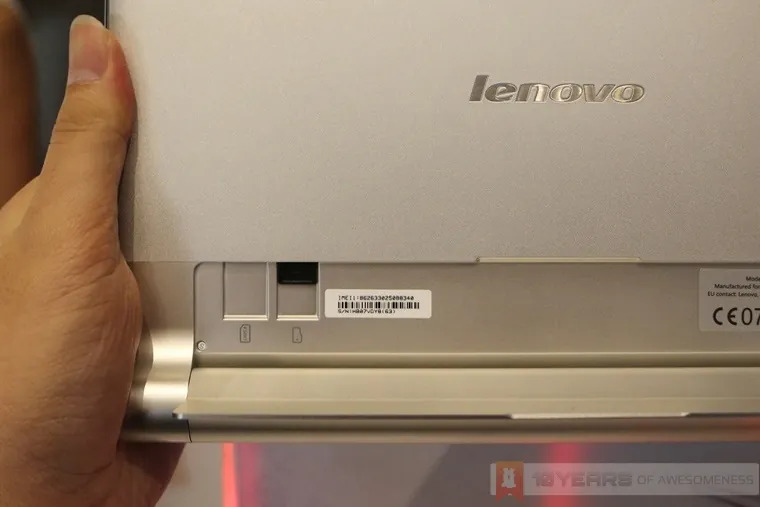 Lenovo didn’t just stop there, either: the side containing the kickstand, while thicker from the rest of the tablet, is also rounded to allow for a more natural and firm grip with one hand (Lenovo coined this as “shifting the centre of gravity” of the tablet, and I guess they’re technically correct here given the shift in weight distribution). 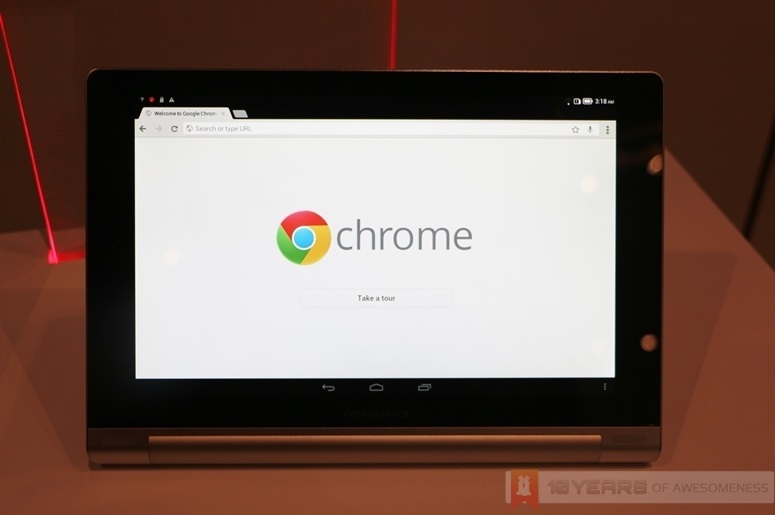 It surprised me how quickly it became natural for me to grip the tablet on the thicker side. Not only was the grip firm, but more importantly it was also comfortable, especially when held over long periods of time. 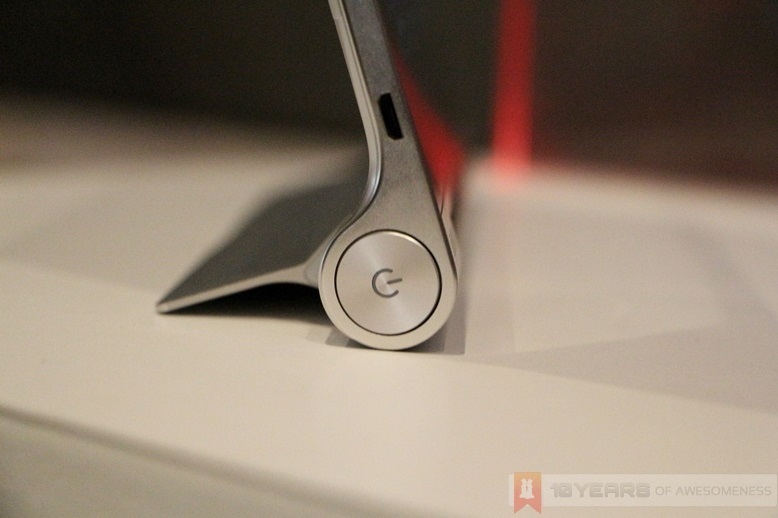 I can imagine this grip to complement reading e-books very well with the Yoga Tablet. 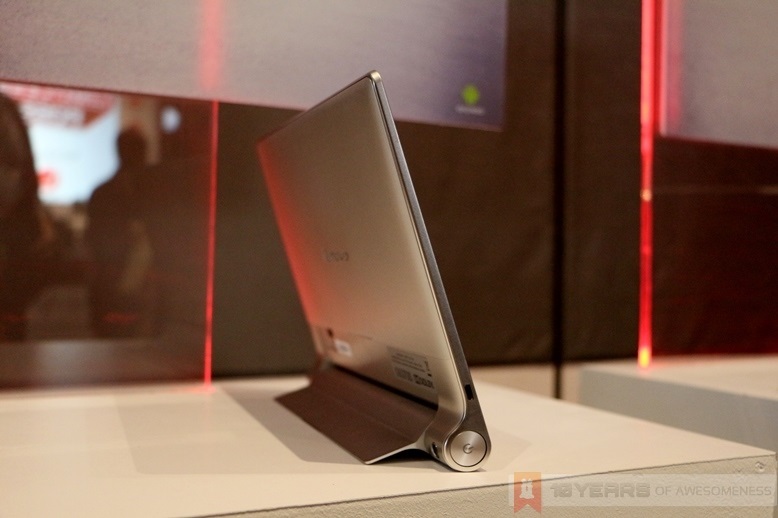 What’s more, the bulbous side also houses a massive battery pack, up to 9000mAh for the 10.1-inch variant. This amount of juice allows Lenovo to claim an amazing 18-hour battery life with the tablet – something virtually unheard of in any mobile device, period. It’s good to know, too, that the Yoga Tablet feels very solid in the hands. The chassis is made from aluminium with slight hints of plastic, but as with other Lenovo products, the Yoga Tablet in no way feels flimsy. And that’s good, because with the integrated kickstand, you’re unlikely to be buying a protective case for the tablet. 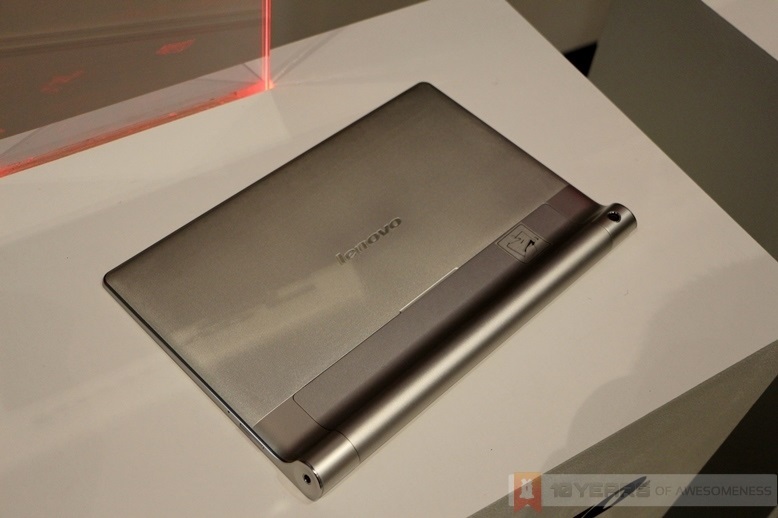 I’m not too sure just how big of an influence Ashton Kutcher had with the design of this tablet, but Lenovo can be pretty proud of what they’ve crafted in terms of the industrial design of the Yoga Tablet. There are, of course, some design quirks. To open the kickstand, you’d need to literally peel it from the back of the device, where a tiny crevice aims to help you slit only a fingernail in. It’s best removed using your thumb, as using other fingers could prove a little more complicated than it should be. 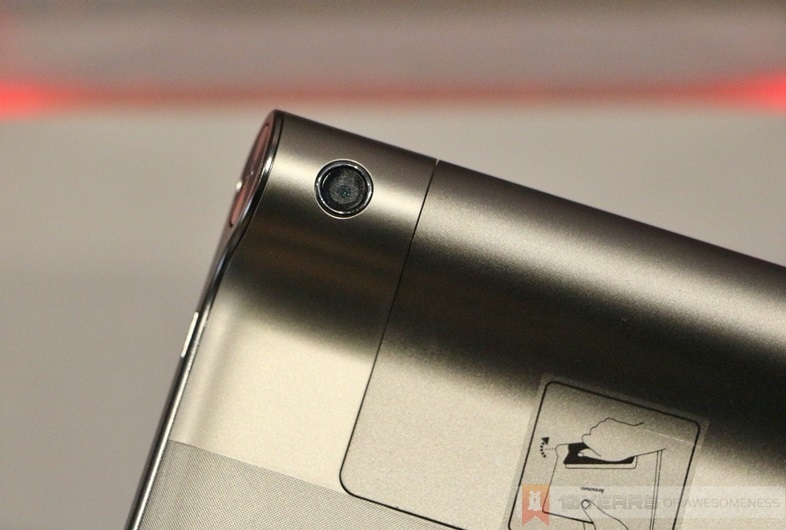 Once you’ve removed the kickstand, you’ll also find that the microSD and SIM card slots are exposed. The slots are placed next to each other underneath the kickstand at the back of the tablet, and while it doesn’t really present a challenge for clumsy users, it does break into the sleek metallic design of the tablet. 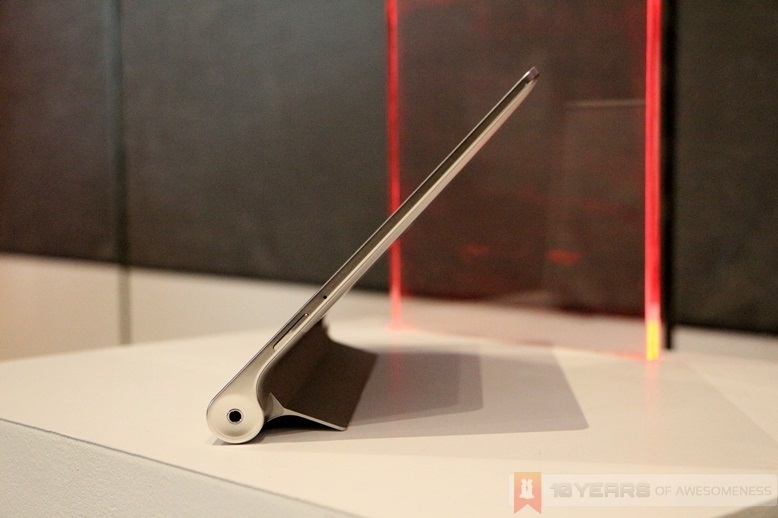 It’s also worth noting that the kickstand does not “lock” into place, unlike a Microsoft Surface tablet. Instead, the hinges are stiff enough to be stable at any angle up until its final default point. 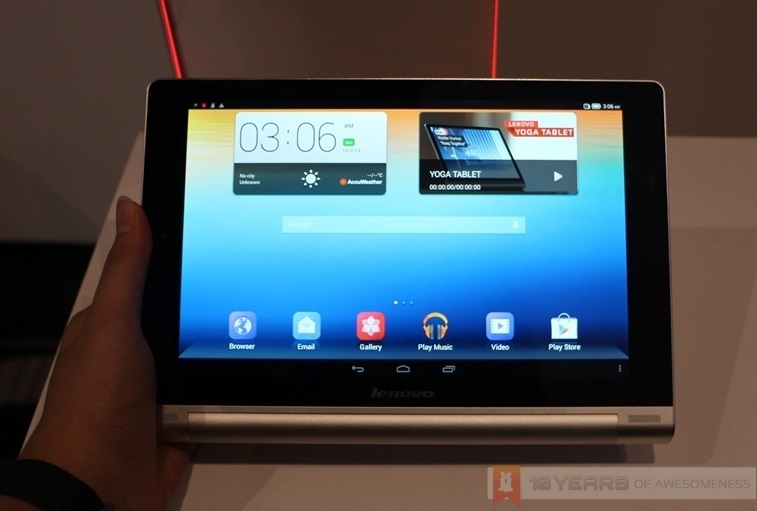 The Yoga Tablet runs on a slightly-customized version of Android 4.2 Jelly Bean. The biggest difference with Lenovo’s Android skin is the omission of an app drawer; yup, all apps are featured on the home screens, iOS-style. For the most part, the Mediatek processor chugs along just fine for basic navigation and tasks, but the budget chipset will begin showing its limited capabilities once more apps are running simultaneously. …which brings us to the price. 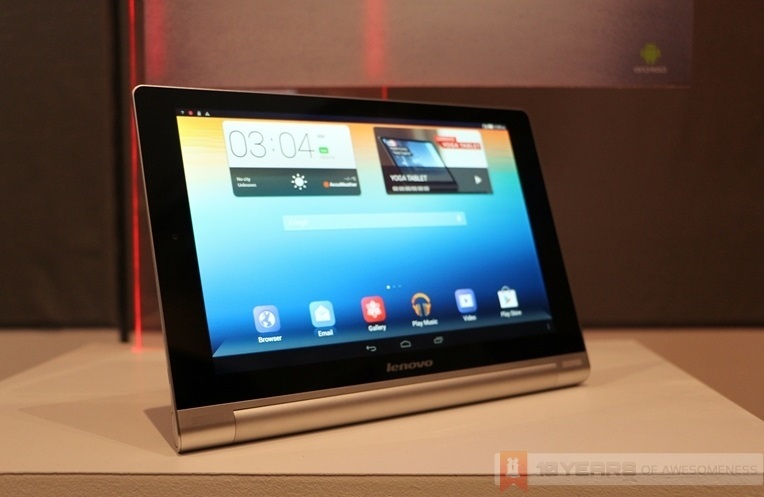 In the US, the Yoga Tablet 8 is priced at $249 and Yoga Tablet 10 retails for $299. Over here, the 8-inch tablet is on sale at RM999 while the 10.1-inch variant costs RM1299 – firmly placing both tablets above the affordable range for a tablet. For RM999, the Yoga Tablet goes head on against the Nexus 7, considered by many as one of the best and most value-for-money Android tablets in the market. So, can the Yoga Tablet and its innovative integrated kickstand work in a market where Lenovo tablets haven’t really succeeded? At this price point, it’s difficult to say yes. 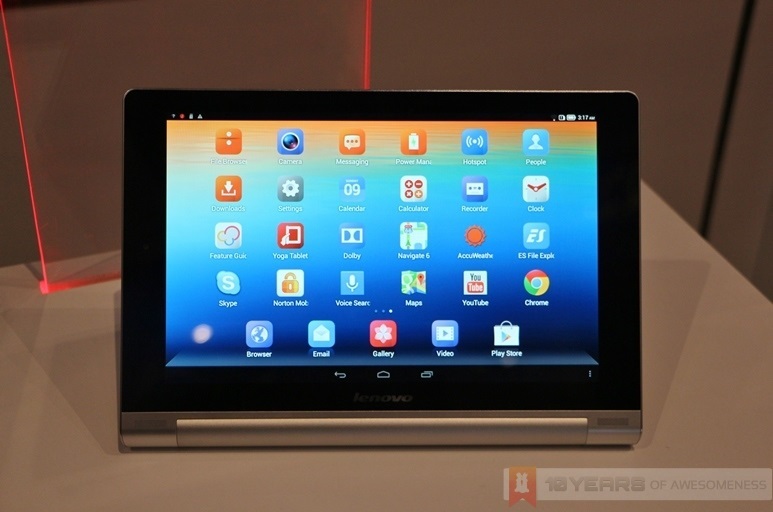 The industrial design of the tablet deserves much better hardware to go with it, but sadly Lenovo has failed to deliver. 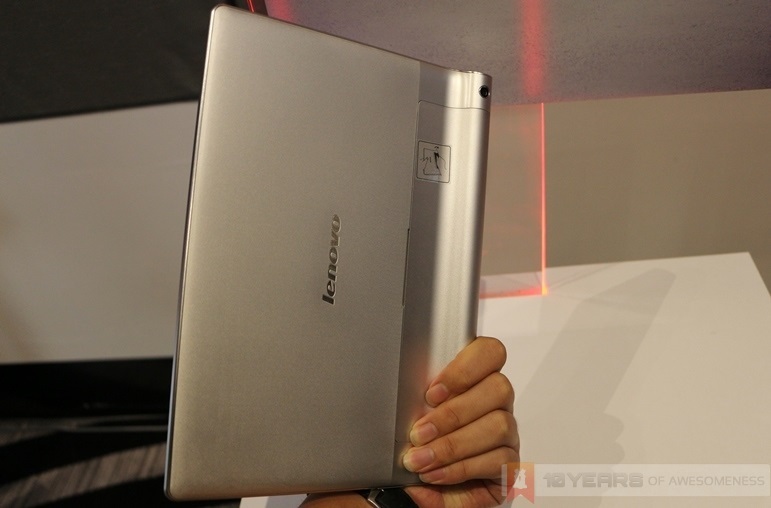 However, I do hope Lenovo works on a better Yoga Tablet 2, because the kickstand really does make a difference in the entire usability of the tablet.